If you were (are) an attorney, what would you think about the Judge’s or Jury’s emotional state if their face looked the same as Mona Lisa’s? Well it’s not a Sincere Smile, so take heed. We don’t look directly at people we don’t like, don’t respect or don’t trust – so while the eyes may be looking at the person of interest the head will not rotate fully – just like Mona Lisa’s. This is a very common display at press conferences, depositions, in court (by all parties), by law enforcement, by child protective service officers, by TSA agents – and of course with spouses, bosses, etc. 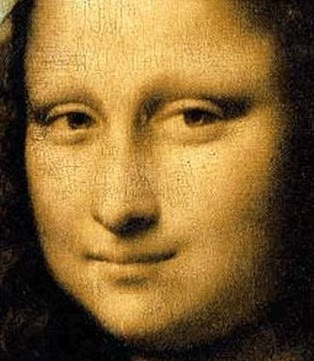 Any time you see an asymmetric smile (and almost any other asymmetric expression), as Ms. Mona is giving us, it is forced and insincere at best – and yet we see much more in Leonardo’s masterpiece. It is important to note that just because a person is insincere in a given moment, does not necessarily mean that his/her entire personality is so – although chronic insincerity is certainly something for which you should be on alert – for it is much more common than most people are aware. The other very common emotion where this asymmetric (and here subtle) looking “smile” is seen is contempt. This is The Mona Lisa’s emotional expression – subtle contempt. With more moderate and extreme examples one side of the mouth will take on a “snarling” posture. This appearance is often short lived, sometimes extremely so – such as in a micro-expression (less than 0.5 seconds and as little as 0.04 seconds). Mona Lisa’s left nostril is also slightly dilated, which is also consistent with the emotional display of contempt. Here the example is fairly mild, though. Contempt nearly always has a component of tightening of the mid-face, and indeed this may be the most prevalent feature. When you think mid-face - think nose, cheek, lower lids, the upper lip and “mustache area”. Most people relatively ignore this region when learning body language. Finally there’s the eyelids. Mona Lisa’s eyes are slightly closed. Slightly closed lids are seen in contempt, anger and disgust. But they also can be seen with a sincere smile. Believe it or not there are different ways in which this slight or moderate eyelid closure can take place. Because this is a work of art - and not a photograph there are imperfections here – and thus her lids are not the best examples of what to look for in any of these emotions. But they are partially closed, again consistent with the emotion of contempt. So the next time you see the Mona Lisa smile in “real life”, think contempt.